The Five elements are a conceptual framework to understanding the human body and the relationship we have with the macrocosms (world outside of us) and microcosms (world within ourselves). The Five Elements move medicine from the realm of the unexplained to a place of observing nature within our own body. In doing this we can move to a place of health by working with the natural order of the universe. Each season and subsequently the elements are associated with particular qualities. These qualities are intertwined and while considered separate from each other ultimately form the whole. One season moves into the next to form a picture of the year. Using the Five Elements we gain an appreciation of disease created in the body and the management of these diseases to promote healing. The physiological relationship of the elements is important for keeping balance of the other. It is in noting this that we move from a massage session such as Shiatsu just band aiding the symptoms to a comprehensive treatment that repairs the root cause of the problem. 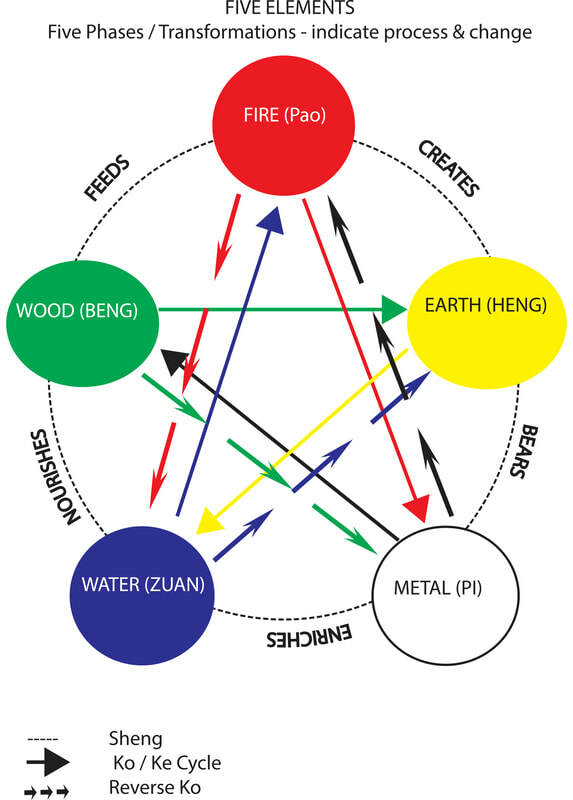 The original model of the Five Elements recognised the Earth Element as being at the very centre of the relationship. The Earth Element is responsible for nourishing and supporting all the other elements. Being at the centre the Earth Element is the communicator between all the elements and therefore we see it as supporting the transition between the seasons. When Earth Element is imbalanced the impact on the entire body is felt. The body cannot support itself when the Earth Element is unstable and meridians, organs and the body systems do communicate effectively resulting in disease physically and emotionally. Each element flows seamlessly into the other when Earth is in balance. We note that wood flows into fire, fire moves through earth which flows onto metal, metal generates the water and water nourishes the wood. As the elements correspond with the seasons we can observe that imbalances of the elements may be aggravated at certain times of the year. It’s not uncommon for the water element to be disrupted during winter resulting in an inability for a natural flow of existence to occur within our body. In fact we are more likely to want to huddle into our houses, rug up and not move as much in winter. If our water element is not balanced this desire is more likely aggravated resulting in loss of the will to leave the house and a building sense of dread and fear. We may also experience symptoms of burn out from over action and this may go onto affect us physically. Issues with urination, coldness in hands and feet, hair loss and even lower back pain could be acerbated in winter. Imbalances in an element are oftentimes more prevalent during the corresponding season and will have specific signs that point to the root cause of the problem. Of course imbalances are not always easy to detect when we are so disconnected from our body. In many causes clients will only consult a practitioner when in crisis. They have had a cascade of symptoms over a long period of time and may have already seen numerous doctors and practitioners before consulting a practitioner versed in Five Elements theory. Regular self-care in the form of massage and yoga can be highly beneficial in support early detection of element imbalances and may even prevent imbalances from advancing to a point of disease. Life is constantly about finding the harmony within our body while living in the external world. I believe that regular activities involving massage, movement and meditation with a mindful attitude can support a connection on the macrocosmic and microcosmic level. We need to find the harmony in both and shiatsu, yoga, exercise and meditation have helped me personally. Now I want to share that with you. If you are ready to learn more contact me for your complimentary chat on how I can help you regain balance, find your happiness in life and remain healthy. Is 75 minutes too long for a yoga class? Are we just too busy to take 60 minutes or more for ourselves? Where did the concept for longer classes come from? What is the benefit of 75 minute session? AND Is any class less than 60 minutes’ worth attending? I have been facilitating 75 minute yoga classes since I gained my yoga instructor certificate back in 2010. Over the years I have changed my classes and run 60 minute sessions and in fact I currently facilitate a Restorative class on a Monday night that goes for one hour. Repetitively I have considered changing all my yoga classes to 60 minutes or even shorter, particularly when I see other yoga classes popping up all around our local area offering classes that are advertised for 45 minutes. At times when I have low numbers I consider that the longer times are prohibitive for our busy mindset. I also wonder if my classes are too costly for the local demographic but given that the 45 minute classes are advertised at $10 and I am still charging $13.50 per class (when you purchase 10 classes) I figure my prices are probably way too low for 60 – 75 minute classes. With these thoughts constantly going through my head, I decided I need to do some meditation, and some research on the benefits of longer classes and why did I start teaching classes for 75 minutes. Mostly I want to ensure that I am not regurgitating someone else’s belief system and if I am do my own beliefs and values align with that way of thinking still. Here is what I discovered about the timing of group yoga practices. Origins of Yoga PracticesHistorically if we look at some of the more traditional yoga practices such as Ashtanga Yoga which was founded in the 1940’s we see that practices are designed for a 90 minute session. The Ashtanga Primary Series which often begins with a sun salutation is made up of repetitive sequences that may take up to 90 minutes to complete. Of course I am not trained in Ashtanga yoga but from my research it seems this would be the most logically explanation to begin answering my why are traditional classes over 60 minutes in length. Even the Bikram yoga, founded in 1970 offers 90 minute classes that follow a specific sequence of yoga asana. Other traditional yoga styles such as Iyengar Yoga and even the more modern form of restorative yoga tend to have longer options of classes lasting anywhere form 75 minutes up to 2 hours. A move to shorter classesIt seems that with the introduction of yoga to the Western world we have truly begun to adapt and modify our practices to suit our lifestyles. Our lives are certainly far busier than they were 20 years ago and we seem to be more at the mercy of technology which makes being busy easy. I have to wonder if this has been the reason for a move to shorter classes. Good business people move with the times and I guess it makes logical business sense that yoga studios and yoga business owners would meet the demand of busy consumers and provide services that support that demand. If numbers are dwindling in longer classes then why not offer shorter classes at times people are more likely to get too. For example in the cities 45 minute lunch yoga classes are available in plentiful numbers. Even I found myself recently offering a 45 minute mum’s and bub’s class to cater for the busy mum juggling babies and older kids. Mind you this was more a sanity choice than a business choice – some of them little ones cannot stretch their little attention spans out past 30 minutes let alone pushing them for 75 minutes. Oh and the sanity is as much for mum as for me (insert cringe worthy grin here). Shorter classes also mean cheaper fees – well at least I would think so. Many of the shorter classes I have seen advertised are often $10 or under to attend. Being a business owner I am not sure how they meet costs unless of course that is the pay off – shorter classes could result in rooms full of busy people and this cannot be a bad thing because at least those busy people are making that 45 minutes dedicated just for themselves. But what about the benefits of 75 minute classes? Mastering the Asana but what about the RestIn encouraging busy people to get onto the mat shorter classes might certainly win but I would be interested in knowing how well rounded the practiced in a shorter practice is. Definitely studies have shown 12 minutes of consistent mindfulness practice even over short periods of time are highly beneficial for changing neural pathways but can a short yoga asana class equate to 12 minutes of mindfulness? Yoga has this wonderful ability at fostering mindfulness and leading us into practices of deeper self-inquiry and self-appreciation. Surely one would think that a longer practice would increase the opportunity for re-patterning and resetting the cellular memory? Of course I am open to hear form someone who might regularly attend these shorter classes to determine their motivation and intention for classes. It might well be that someone attending the 75 minute class only comes for a physical activity and the self-enquiry part be damned. Now surely if one was going to attend a regular yoga class there would be an expectation of a meditation or active relaxation at the end? I know whenever I have left out a full 15 minutes of active relaxation at the end of a class I feel like I am ripping my clients off. This could just be my own projection here because I absolutely LOVE the bit at the end where we do nothing – no movement, no brain work, just pure relaxation. In fact if we look at the historic reasoning how the yoga asana came about it was to enhance the effectiveness of mediation. The original Guru’s of yoga would sit for hours at a time in meditation only to find that the body began to seize up. Yoga Asana was designed to complement the long periods of sitting and what they found was a more enhanced meditation. In my head I see a physical practice vital for the creation of space in the mind through mediation. This makes me now wonder if a shorter class includes all the yummy bits of a yoga practice like pranayama and meditation. I guess I might need to explore this topical a little bit further as I seem to have developed more questions than answers. 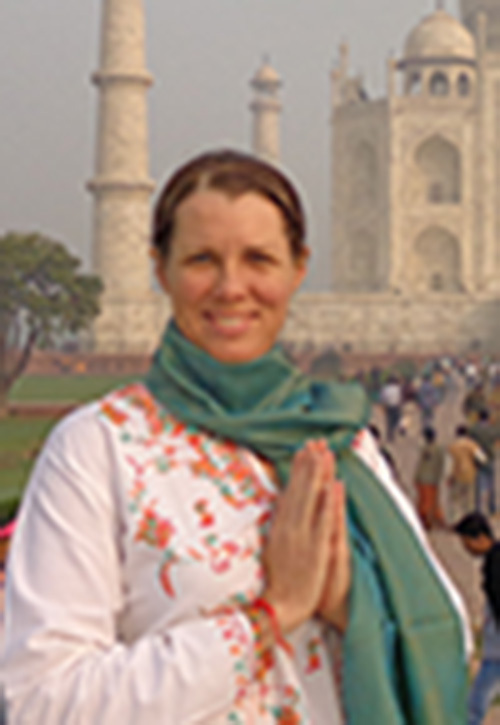 One thing is for sure at the moment I prefer my offerings of 60 – 75 minute yoga classes, for myself and for clients. In that time I feel I am able to experience and offer a well-rounded practice where yoga can be fully appreciated and explored. How do you feel about it? I would love to hear. Most of traditional use for castor oil is based on folk medicine and anecdotal evidence. There are some studies that have demonstrated castor oil to be a powerful anti-inflammatory. In ancient times castor oil was used to initiate labour, as a laxative, wound healer and for skin tonification. Castor oil comes from seeds of the ricinus communis plant found in India, parts of Africa and Asia. The seeds themselves cannot be consumed as they are highly toxic, however pressing the ripe seeds produces an oil which has many known uses. The main compound found in castor oil is ricinoleic acid (RA) which is demonstrated to have analgesic and anti-inflammatory properties. It is highly recommended that when using castor for the first time you choose an organic cold-pressed brand. There have been reports of allergic reaction and some suggest that the method of extraction and / or the origin of the seeds to be the cause. Always perform a spot test before using any topic or internal product for the time to ensure no allergic reactions occur. If trying to conceive use between day 1 and ovulation of your menstrual cycle. The heat pack will assist with menstrual pain, stimulate circulation, aid in detoxification of the body and break down adhesions and scar tissue. Produces Mucus for protection and reproduction - The cervix produces mucus in the endocervix. The mucus protects the uterus from bacterial infection. However it is also highly effective at stopping sperm from entering the uterus. Thankfully the body is designed for reproductive purposes and every month around ovulation the mucus changes. Throughout the menstrual cycle it is possible to notice these changes. At certain times you will notice the mucus to be thicker and other times it will be thinner. The thinner mucus allows sperm to pass into the uterus where conception can occur. Supports Passage of Sperm into Uterus – Besides changing the mucus consistency to support conception, the cells of endocervix also projects hairlike structures called cilia that along with the thinner mucus help facilitate the movement of sperm through the cervix canal. Gateway during menstruation and birth - Each month during menstruating age, most women will experience a shedding of the uterus lining. The lining passes through the cervix on its release from the body. During labour and birth, the cervix widens (dilates) to allow the passage of a baby through the birth canal. Incorrect posture, overuse, stress and poor lifting techniques contribute to lower back pain. One of the deep muscles of the back is the Quadratus Lumborum (QL). It is a quadrilateral muscle that extends from the posterior pelvis to the twelfth rib attaching to the lumbar spine. It is actually a deep abdominal muscle. If you have a weakness or too much tension in this muscle you are likely to be weak in your core. This can contribute to pain either in your back or abdomen. In Oriental Remedial treatment the general outlook of the cause for back pain is considered from a different perspective. Back pain may be a result of Cold invasion, Qi or Blood stagnation or in more chronic cases Kidney deficiency may be considered. In shiatsu we would look at diagnosis from a place of body and meridian imbalances. When treating lower back pain I look at several areas of imbalance including the Kidney / Urinary Bladder Meridians and Liver / Gall Bladder Meridians. When considering the physical body and treating the QL muscle as part of the imbalance I prefer a side lying position and ‘enter’ this muscle through the Gall Bladder Meridian. Another often unused meridian is the Girdle Vessel or Dai Mai. The Girdle Vessel is one of the extraordinary vessels and is considered to be the ‘belt’ meridian that ‘holds’ all the other meridians together, just like a belt bundling up sticks of bamboo. The Dai Mai along with the other extraordinary vessels was the first meridians to form during the embryological development. Suzanne Yates refers to the extraordinary vessels as having vital connection to our brain, reproductive organs, kidneys and heart. They are vital to understanding our genetic disposition and powerful for enhancing good health, longevity of life and quality of living. The Dai Mai itself has responsibility for the upward and downward flow of Qi and ensuring balance of all other meridians. If the Girdle Vessel is too slack integrity of the 12 main meridians including the Gall Bladder meridian may be weakened. If the Girdle Vessel is too tight we experience constriction of the 12 main meridians. An article online from Acupuncture Today discusses Dai Mai Obstructive Disorder painting a picture of the symptoms that come from Girdle Vessel being too tight. As the Girdle Vessel encircles the body from the diaphragm to below the pubic bone breathing difficulties, lower back spasms and even upper leg weakness can be present if the Girdle Vessel is impacting on the other 12 main meridians. There are several significant acupressure points that lie on the Girdle Vessel and interestingly several of these lie at access points to the QL muscle. Gall Bladder (GB) points 25 and 26 are two acupressure points I hold for treating lumbar pain. Gall Bladder 25 is located on the lower border of the twelfth rib which is the insertion point of the QL muscle. Gall Bladder 26 is the point where the Gall Bladder Meridian meets the Dai Mai Vessel. It is found at the intersection of two imaginary lines. Find GB26 by drawing a vertical line from the end of the eleventh rib and a horizontal line from the belly button. The QL functions to elevate the hips therefore it may also be beneficial to treat around the anterior and posterior aspect of the pelvis. Favoured acupressure points that lie on the Dai Mai vessel and support the QL muscle include GB 27, GB 28 and Urinary Bladder (UB) 26. There is a significant peripheral point for the Dai Mai which is once again on the Gall Bladder meridian. GB 41 is known as the master point of the Dai Mai. I love accessing this point in foot acupressure treatments. It has many benefits beyond treating conditions on the Dai Mai Vessel. So while this article focuses on the QL muscle and the meridians used for treating weaknesses and tensions related to the QL we start to see some very powerful meridians in use. Perhaps my next article needs to be on the Extraordinary Vessels seeing as they are featuring quite regularly in my shiatsu treatments. The Quadratus Lumborum (QL) is a deep abdominal muscle (Beil, 2010). It originates at the posterior iliac crest and attaches to the twelfth rib and transverse processes of the lumbar spine. It is often the number reason for back pain. Overuse, stress and strain are the general cause of issues with the QL. Sitting and standing for long periods of time contribute to pain from this muscle and often incorrect repetitive motion such as twisting, bending or lifting incorrectly will exacerbate a weak or tight QL muscle. When do you use the QL? When we practice yoga we may think we are working our physical body. However yoga is more than the physical. Yoga truly is a full mind. body and spirit practice. This means we practice all aspects of our being including our energetic body. Stresses, tension, problems can cause imbalances – chakras are said to be in deficit or excess (defined by speed of spin and direction of spin). Normally chakras spin clockwise (energy pulled inward). When out of balance chakras may spin counter clockwise (exerting energy outward and not willing to accept energy in thus depleting the body of that energy field). There is varying belief about this and some suggest that a chakra that spins counter clockwise may be working with the natural Kundalini flow. Pranayama exercises, Asana practice, meditation and mantra chanting can be used to bring the chakras back into balance. Other non-yogic practices can also be used to help balance the energies of the chakras. Yoga is concerned with universal connection of the individual. Spiritual oneness between the universal energies and the individual are the ultimate outcome with Yoga. The Chakras are fundamentally a connector to the conscious collective, the divine or universal consciousness. The Chakras are a powerful tool for growth. Chakras are wheels of energy that link mind and body and integrate our emotional experiences to the physical world. Through yoga and other tools that invite us to tap into charkas we are able to connect to the universal consciousness that runs through each and every one of us. Humans are the conduit for connecting heaven and earth and when we utilise the system of energy that runs through the ancient yogi’s identified as chakras we can manifest our dreams into the material world. Physically chakra corresponds to nerve ganglia. Metaphysically chakra is felt as a vibration. Each chakra is associated with a level of consciousness and when the chakra vibrates freely and unimpeded we experience an understanding of the collective consciousness that vibrates within us. Chakra's that are deficient, in excess or stagnant prevent an impediment to moving to the next level of consciousness. Ultimately this type of energetic imbalance prevents us from experiencing our fullest potential. There are various methods that we can balance our chakra system so that we can fully appreciate the movement of energy throughout body and move through each level of consciousness. Yoga is just one method. In my manifest your year workshop I talked about a couple of other methods we can use to help shift excess and stagnation and stimulate the movement of energy through each chakra. Over the next few weeks I will use chakras as a teaching tool to help you connect with your energetic and consciousness potential. Make sure you follow Mindful Living Matters on Facebook and join the Mindful Living Group. And if you would like to experience the practical aspects of chakras in your body join me for yoga each week in Petrie. Emotional eating is using food to fill an emotional need rather than filling our body for hunger and health. Often we reach for the ice cream, the chocolate or foods that we might normally consider “junk” food. Unfortunately food can never really fill the emotional hunger or emptiness we may experience at different times of our lives for different reasons. Lately I have been reminded of emotional eating. Personally it is one of my cyclic battles. When I find myself in a 'crisis' situation I tend to forego putting myself first and will reach for the easiest and most convenient item to put in my mouth for self-nourishment. On occasion I have been known to skip meals or eat proportionally too much. All of this then leads to a cascade of chemical responses in my body that results in cravings, depression and a perpetuation of the cycle of emotional eating. So what is mindful eating and how can it assist with overcoming emotional eating habits? And I use the words habits because that is what we are doing when we create these cycles because habits are behavioural responses resulting in chemical responses in the body. When we talk about mindful eating we are wanting to create mindful habits. I would even go onto add that for defining mindfulness for eating, that we have a conscious awareness of where our food has come from and the processing and preparation of the food to get to our plate. If you are the main food preparer than your sense of mindfulness in the preparation of that food is something to consider as part of the process and definition. When you start to become mindful of the whole process of food we start to develop new habits and thought processes around food itself. Habits are not always easy to change and it takes a lot of practice. But it is possible to change the unhealthy habits we have formed to embrace a conscious, mindful way of eating. Ultimately the goal is to form newer healthier habits that have lasting effects and maintaining those habits by practicing mindfulness in all aspects of our life. There have been numerous studies that have demonstrated the effectiveness of mindfulness practices such as yoga and meditation which mediate increased body awareness. Asadollahi et al (2015) found that mindfulness training led to cognitive changes in the way of thinking and actions of patients and is advantageous in conditional strengthening principals. This impacts the individual’s desire to continuously work at making health decisions to improve their life. This applies to changing our emotional responses and how we habitually view and use food to either 'stuff down our emotions' or counter a negative feeling. If we can bring regular mindfulness activities into our daily life we can strengthen our mind's response and deal with emotions when they arise in a healthy way. Our decision making capacity will improve and we will be less likely to reach for the chocolate when times get difficult. Mindfulness brings physical awareness to the act of eating. It gives you an opportunity to identify the triggers and change the habit of reaching for the ‘junk’ food. Practicing mindfulness gives us an opportunity to learn how to recognise the difference between emotional hunger and physical hunger. We can also be prepared for those emotional responses and learn to differentiate between emotional hunger and physical hunger before we reach critical point. Learning your triggers and dealing with the full extent of what is causing your emotional response should also be considered as part of your mindful eating program. Unacknowledged feelings can often be responsible for emotional eating. This is why I have added journalling to the bottom of the list. Taking some time to sit in meditation and then journal any emotions or feelings that arise during that quiet time will help to understand the true cause of what is going on for you when you develop those food cravings. If you want to learn more about mindfulness and how it can help you form healthy habits please contact me. I am happy to support you on your journey to happiness, health and harmony of mind, body and soul. The benefit of Downward Facing Dog (Adho Mukha Svanasana) for women’s health is wide and varied. Some schools of thought do not recommend inversions during particular parts of the menstrual cycle. Yogic philosophy suggests that apana, the downward flow of energy is challenged during inversions and the natural flow of menstruation (a downward flowing elimination) may be disturbed. Inversions, such as Downward Facing Dog are considered high-energy poses and because a women’s energy may be depleted during menstruation high energy poses should be avoided. Practicing inversions during menstruation is definitely an individual choice and it is not up to me to determine who should and should not practice Downward Facing Dog but I do ask each of you reading this to consider your own needs during your menstrual cycle. Downward Facing Dog can be helpful for women who suffer Premenstrual Tension (PMT). Benefits include reducing severity of headaches, calming the mind, relieving heaviness of the body, bloating and relieving pain in the back. Sometimes a support such as a bolster, blanket or block under the crown of the head can be used to relieve headaches and fatigue. Asanas in general support the reproductive system however Downward Facing Dog may optimise fertility. According to Bobby Clennell (2007) downward facing dog is beneficial for correcting a displaced uterus. While a displaced uterus does not directly cause fertility issues it can be associated with other conditions that may make conception difficult (Whelan, 2017). Downward Facing Dog helps to increase blood flow throughout the body including organs of the pelvis, providing nourishment and keeping the reproductive system oxygenated and healthy. Being a calming and cooling pose Downward Facing Dog can release stress and promote a sense of relaxation for women undergoing fertility treatment. During Menopause downward facing dog can be highly effective at relieving hot flushes. According to Suza Franzina (2003) hot flushes represent a release of kundalini energy which can negatively impact the nervous system at the time of menopause. Downward Facing dog is a cooling pose and helps to calm the nervous system making it an effective pose for relieving hot flushes before they occur. As a woman transitions to motherhood through pregnancy practicing downward facing dog is a reminder of personal strength. Being a full body poses downward dog strengthens the body supporting you as you transition from one position to another. Practicing with mindfulness and adjusting to suit the stage of pregnancy is recommended. The therapeutic benefits of downward facing dog have varied application throughout the entire cycle of a women’s adult life from menarche to menopause. This is definitely a favourite pose to practice and if you want to learn more about the anatomy of the dog so as to include it in your practice read more here or join me in a class.